As a new or newer health coach, it likely feels like there are SO many things you need to do to set-up your business for success and attract clients. You have a long to-do list, but a limited amount of time to work on your business, so you need to work smarter not harder. You want to get the best bang for your buck when it comes to spending your time. Whether you have 5 hours, 20 hours, or 40 hours, you want to know that the things you’re doing are getting you the best results possible. Unfortunately, I see a lot of health coaches filling up their to-do lists with tasks that aren’t driving their business forward. Are you spending your time scrolling through social media, leaving your business cards behind at cafes, or spending hours perfecting your website? Here’s what I want you to know: These types of tasks can fill up your time, but from what I’ve seen, they don’t bring more than the occasional client in the door. 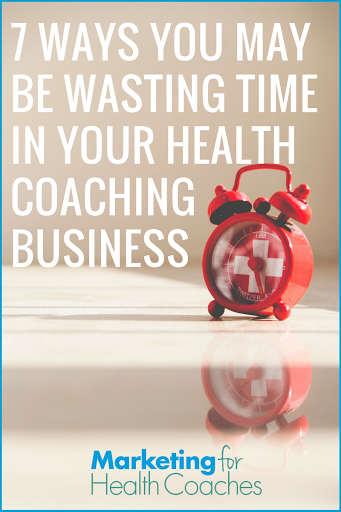 In this post, I’m highlighting 7 ways I see health coaches wasting their time… so you can spot your own time-wasting behaviors and start to focus your limited time and energy on the strategies proven to get you clients! With so many options available for marketing yourself, it’s a challenge to know what tasks are ‘right’ and ‘wrong’. One way I see coaches focusing on the ‘wrong’ things is by spending hours and hours on their website, logo, or design scheme. Creating a brand for your business is fun! Having a professional website and logo can really make you feel like a pro, but if you’re spending too much time here that means you aren’t spending time talking to potential clients. Designing the perfect logo is not going to get you clients. These are the kind of things that you can focus on later. If you want to start getting clients now, this should be put on the back burner. There are a lot of ways to reach people, and when you’re a new coach it can seem appealing to use passive tactics that feel easy. Unfortunately, they’re not likely to bring in more than the occasional client. Strategies like sending letters to doctors, postering or putting up flyers in cafes are typically not worth the time it takes. I posted flyers when I was starting out as a health coach, and while it may have gotten me more visibility, I only got 1 client from a flyer – ever! I would have been better off networking, building relationships, and eventually asking for referrals. I see a lot of coaches investing their time into marketing activities that they don’t enjoy. For example, maybe you hate writing, but you’ve been told you need to blog every week. This is torture for someone who hates writing! Not only will this make you resent your own business, but it’s likely that your lack of passion will show in your writing. So why waste your time on a marketing strategy that you don’t like and won’t resonate with your audience anyway? Instead, you could do a weekly video on Facebook Live and share the video on your blog. This one is especially tricky. I see a lot of coaches who are doing all the right things, but still not seeing results. The problem 99% of the time is that they’re doing the right things the wrong way. There’s often a few pieces missing that they need some guidance on to start getting clients from the strategies they’re implementing. Coaches who are giving talks, but not making a compelling or time sensitive offer at the end. They aren’t giving the audience a reason to sign up. Coaches who are networking, but expecting the magic to happen in the meeting. Networking requires relationship building and most importantly, follow up! Coaches who are meeting with potential referral partners, and asking for referrals in the first meeting without building a relationship first or offering anything in return. Everyone and their aunt wants to build an online course these days! The idea of having a lower-priced offering and being able to serve many people at one time is appealing. If you do want to offer an online course or a coaching program, nowadays, there are plenty of done-for-you programs out there, so there’s no reason to waste time creating materials for programs or marketing if that isn’t your strength. Investing in a done-for-you program with templates and lessons on how to use it, will save so much time. That way, you can focus on talking to potential clients rather than designing handouts. You can always customize these programs to make them ‘your own’ or create a program from scratch in the future. I’m not saying social media and online marketing aren’t important or that you should stop doing them, but typically until you’ve built up a pretty big following or have a closed Facebook Group with an audience you’re nurturing, social media doesn’t bring in clients for most people. Social media should be a supplement, a way for people who’ve heard about you or who you’ve met to find out more and interact with you. Of course, it’s possible to get there, but building up a large audience takes time. If you need clients now, it’s important to put more time into more immediate client-getting activities. There are a lot of strategies out there that seem relatively straightforward, until you get down to the technical implementation. Plugins, software, autoresponders, power editor… there are enough new terms when it comes to digital marketing that you’re practically learning a new language! I see a lot of coaches attempting to setup complex marketing strategies and feeling like a failure when it doesn’t work. What are these technical beasts? Facebook ads – there are a lot of moving parts when it comes to managing a Facebook ad campaign. Everything has to be just right for them to work. It requires several levels of technical setup and consistent testing to get it right. Is my ad copy & graphics compelling? Will my landing page convert? Does my opt-in gift resonate with my audience? Is my opt-in connected with an autoresponder series? Does my email sequence convert subscribers into either purchasing your ‘easy yes’ program or booking a consultation call? If you don’t know the answers to these and you haven’t tested them, Facebook ads can be risky and a waste of money. Webinars – some coaches assume if they want to use speaking as a tool to get clients, they must do it online using complex webinar software. While webinars can be a great way to reach a new audience and convert clients, you can definitely go the low-tech route and do speaking gigs in person. I have had great success with this strategy and so have many of my clients. There are plenty of strategies that don’t require any technical know-how, so if the tech piece is intimidating you, skip it for now. You can always hire someone to help you implement these strategies once your business is ready for it. 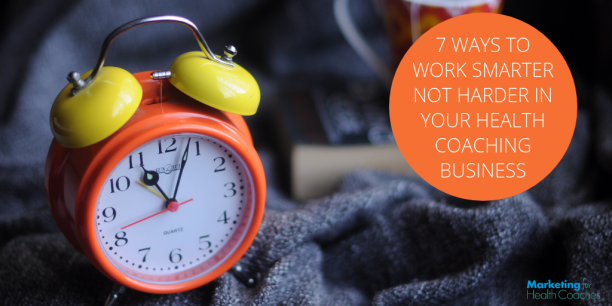 As you can see, it’s easy to squander loads of time when you’re ramping up your business. And let’s face it, you need to work smarter not harder to make the most of the limited time you have. Hopefully you’ve been able to identify some things that you can take off your to-do list (or at least put the pause button on for a while). In what ways do you feel you may have been wasting time in the past? What changes can you make to work smarter not harder? Share your comments and questions below. Thank you so much for the helpful info! I’m a seasoned personal trainer and a new health coach who is working to run my own business! The last few months I have spent endless hours on social media, without seeing the progress I want. So now I’m organizing some free challenges to build a clientele. I also have plans of reaching out to the city I live in and hope to be holding some speeches to the community at the city hall. I opted in with you and Kathleen and I am so thankful for the templates and great info! Thanks so much for your help, things are starting to become more clear and I feel like I know which direction to go. You are very welcome Courtney! I love that you’re planning to hold speeches! That’s my favorite client-getting strategy!